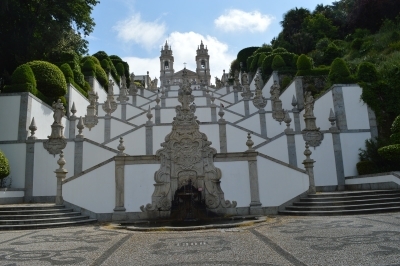 Sanctuary of Bom Jesus do Monte in Braga is part of the Tentative list of Portugal in order to qualify for inclusion in the World Heritage List. The Sanctuary of Bom Jesus do Monte is a pilgrimage site, only about 25 kilometres north of Guimarães. The pilgrimage church is located on the eastern outskirts on a hill overlooking the city of Braga. In the 14th century, the first chapel was built in that place. The construction of the ensemble in its present form, with the Baroque staircase and the pilgrimage church, was started in the 18th century and completed in 1811. Having already visited several monasteries, churches and cathedrals on my trip to Portugal, I was not very keen on visiting yet another religious site. But Bom de Jesus is scheduled for decision at the WHC session in 2019, thus it was no question that I made the short detour via Braga on my way from Oporto to Guimarães. There are three options to get to the pilgrimage church. The classical way is to climb the imposing Baroque staircase. Second, with the historic funicular. And third, by car or bus straight to the top of the hill. Of course, I chose the classical way, well not really the classical way, that would mean climbing the stairs on hands and knees. For my way down, I took the funicular. The staircase has almost 600 steps and leads in a zigzag up to the forecourt of the church. The first part of the pilgrim path is dedicated to the Via Crucis, several chapels represent the Passion of Christ. After a few minutes walk through a forest, you arrive at the first viewing platform. The photo shows the view to the upper two-thirds of the staircase, this is the most impressive part of the site. On each landing is an allegorical fountain decorated with statues and other symbolic elements. The fountain on the second platform symbolizes the Five Sacred Wounds. The following series of fountains represents the five human senses: sight, smell, hearing, taste and touch; each with its own fountain. This was my favourite section: the water gushed out of orificies such as nose, ears, eyes and mouth. The last section is dedicated to the three Catholic virtues: Faith, Hope and Charity. The Baroque staircase with the view of the church was a pleasant surprise and is the most outstanding part of the TWHS. Less impressive was the interior of the church, worth mentioning is the altarpiece depicting the crucifixion. I visited this TWHS on a weekday morning in May 2018. When I arrived at the entrance gate at 9 am, there were only a few other visitors, but after an hour the first busses with tourists arrived. Apparently it is a popular pilgrimage site, as shown by the numerous restaurants and hotels on the hill. All the former pilgrims' hostels around the church have been converted into hotels. The Sanctuary is surrounded by a small forest with artificial grottoes, statues and a small lake. In total, the site has a size of 30 hectares (according to the T-list entry on the Unesco website), obviously large enough to nominate this TWHS as a cultural landscape. The benefit is that the state party can nominate two cultural sites in one year. In my opinion, Bom Jesus do Monte has a good chance of being inscribed in the WH list. At least better chances than the Mafra Palace, the second Portuguese nomination for 2019, and I liked it better than most of the other TWHS that I have visited on my Portugal trip. Baroque architecture and Christian sites are already well represented on the WH list, but the impressive staircase is an exceptional feature. Maybe enough to convince the WHC of the outstanding universal value of the site. Anyway, I enjoyed my little pilgrimage more than I had expected before. 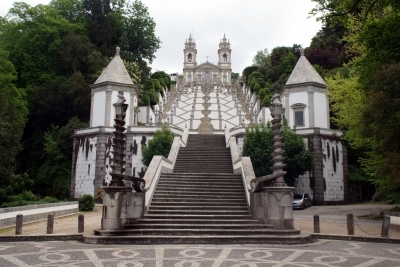 In June 2018, I rented a car and drove from Porto to the Sanctuary of Bom Jesus, a pilgrimage site in northern Portugal that’s known for its monumental zigzag stairway. Pilgrims traditionally ascend the 577-step Baroque staircase on their knees. I opted, instead, to take the 1882 water-powered funicular.